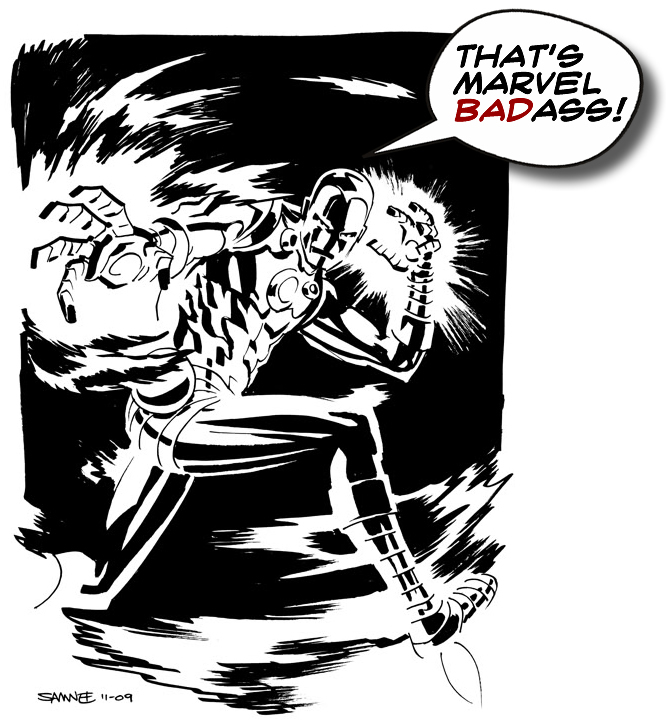 This week’s Marvel BadAss Award goes to Chris Samnee for this insanely cool Iron Man sketch. For my money, it doesn’t get cooler than the red and gold armor … and Chris wrings every drop of coolness out of it here. And, in black and white, no less. Chris’ blog, featuring a daily sketch, is a required daily visit here in the Fortress of Smartassitude … and if you’re not following him on Twitter, well … you’re just missing out. Why don’t you just visit by clicking here and stop depriving yourself? You can even bring a little bit of his brilliance home with something from his store. DISCLAIMER: This message was not endorsed by Chris Samnee. It was paid for by … well … WordPress. This blog is free, baby. This entry was posted in Comic Books, Marvel Comics and tagged Chris Samnee, Comic Books, Iron Man, Marvel Comics. Bookmark the permalink.